vidhyashakti is a current affairs and general knowledge weekly. current affairs is a very important thing in the gujarati competitive exam. If you have good current affair's knowledge, you will get its benefit in Gujarat government exam, central government exam, and other competitive exam. Current affairs includes Gujarat, India and world events and issues from the field such as politics, geography, economy, history, science, Defence,sports, foreign policy etc. you will get this all types of current affairs and general knowledge in Gujarati current affairs and general knowledge weekly vidhyashakti. You will get current affairs from vidhyashakti which is related to exam like, GPSC,GSSSB, TAT, TET, CLERK, SENIOUR CLERK, Gujarat panchayat service selection board, district panchayat service selection board, lokrakshak recruitment board, high court exam, ssc exam,railway board exam, bank exam, ibps exam,army exam, naval exam, airforce exam etc. vidhyashakti current affairs magazine edition-106 you can read about 15th fianance commision visit gujarat, prime ministe visit of ravanda, uganda and south africa etc. we also gives the information about gujarati abhinetri rita bhadudi death, gopaldas niraj death , brahmos missile success test etc. 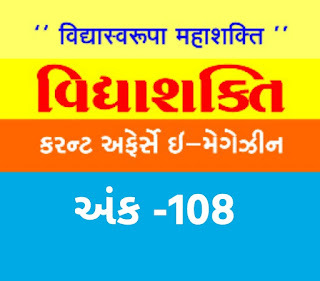 VIDYASHAKTI CURRENT AFFAIRS E- MAGAZINE VIDHYASHAKTI nstitute for Competitive Exam(ICE) established on 18-07-2010 is situated in Rajkot City of Saurashtra Region of Gujarat State. This Institute Provides Master Training to the Students of Gujarat of related Competitive Courses (Gujarat Govt. & Central Govt.) such as GPSC, UPSC, Bank PO/Clerk, Staff Selection, FCI, Railway, PSI, TET/TAT AND all kinds of Competitive exams.